Also serving communities of Saddle River, Hillsdale, Waldwick. There are 28 Memory Care Facilities in the Woodcliff Lake area, with 3 in Woodcliff Lake and 25 nearby. The average cost of memory care in Woodcliff Lake is $6,326 per month. This is higher than the national median of $4,650. Cheaper nearby regions include Park Ridge with an average starting cost of $6,230. To help you with your search, browse the 2 reviews below for memory care facilities in Woodcliff Lake. Better rated regions include Ramsey with an average rating of 5.0 out of 5 stars. Caring.com has helped thousands of families find high-quality senior care. To speak with one of our Family Advisors about memory care options and costs in Woodcliff Lake, call (855) 863-8283. Woodcliff Lake is an affluent suburban community located in northern New Jersey. Like other parts of Bergen County, the area has a sizable population of adults 65 and over, which is typically linked to a higher rate of Alzheimer's disease and related dementias. To accommodate the needs of this population, Woodcliff Lake is home to several memory care facilities, and more than two dozen other options are located in the surrounding area. To comply with state regulations, assisted living facilities must have appropriate accommodations, properly trained staff and protocols for providing personalized care. Due to its desirable, well-connected location, Woodcliff Lake is twice as expensive when compared to the typical American city. Housing costs are approximately four times higher than the national average, although groceries, healthcare and utilities aren't subject to the same premiums. Decision makers may want to consider alternative areas since Woodcliff Lake's high cost of living can influence the affordability of memory care services. The Woodcliff Lake area is home to several world-class medical facilities, including those specializing in brain health and dementia care, such as the Neuroscience Center of Excellence at The Valley Hospital, St. Joseph's Medical Center and the VA New Jersey Health Care System, in the event of medical emergencies or illnesses. Woodcliff Lake has a mixed climate. Winters can be harsh with snow, ice, mixed precipitation and average lows in the 20s. Summers are typically hot and humid with highs in the upper 80s. To keep residents safe in all types of weather, memory care facilities should have appropriate heating and cooling systems as well as restricted access controls. As part of the New York City metropolitan area, Woodcliff Lake experiences more than 20 high-ozone days annually, which can worsen residents' breathing difficulties. In general, elderly individuals are more susceptible to poor air quality. Of 227 areas surveyed by the American Lung Association, this metropolitan area was one of the 10 worst based on year-round ozone levels. Memory Care costs in Woodcliff Lake start around $6,326 per month on average, while the nationwide average cost of memory care is $4,800 per month. It’s important to note that memory care rates in Woodcliff Lake and the surrounding suburbs can vary widely based on factors such as location, the level of care needed, apartment size and the types of amenities offered at each community. 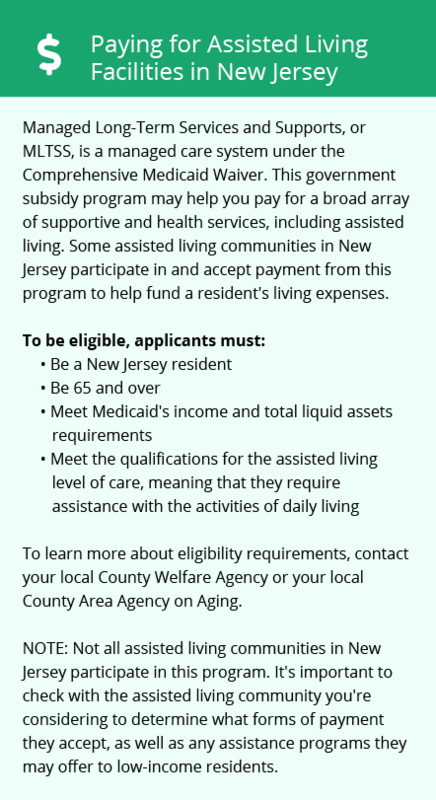 Woodcliff Lake and the surrounding area are home to numerous government agencies and non-profit organizations offering help for seniors searching for or currently residing in an assisted living community. These organizations can also provide assistance in a number of other eldercare services such as geriatric care management, elder law advice, estate planning, finding home care and health and wellness programs. To see a list of free memory care resources in Woodcliff Lake, please visit our Assisted Living in New Jersey page. 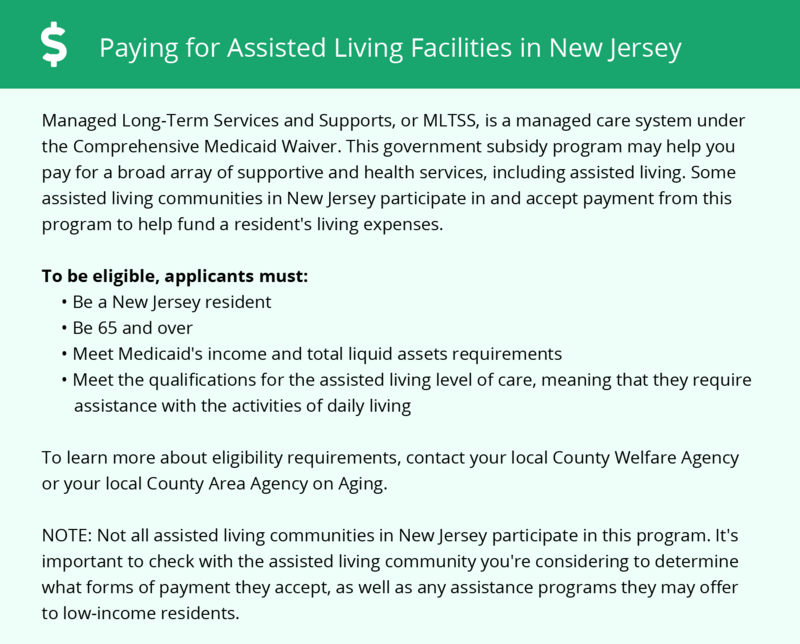 Woodcliff Lake-area assisted living communities must adhere to the comprehensive set of state laws and regulations that all assisted living communities in New Jersey are required to follow. Visit our Memory Care in New Jersey page for more information about these laws.